How Do You Figure Out How Much Something is Marked Down? Going shopping? Is something you want on sale? Trying to figure out the sale price of that item? 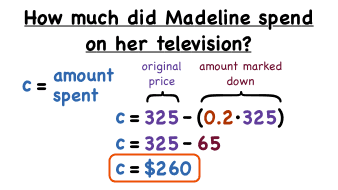 Follow along with this word problem and you'll see how to calculate that price! How Do You Figure Out Sales Tax? Going shopping can be tons of fun, but things can go sour when you get to the register and realize that the sales tax puts you over your budget. Always stay under budget by figuring out your total cost BEFORE you hit the check out. Watch this tutorial and learn how to calculate sales tax! Word problems are a great way to see math in action! See how to create a table from the information in a word problem. Then use that table to write an equation and solve to find the answer. Interest is found in a bunch of places: savings accounts, mortgages, loans, investments, credit cards, and more! Watch this tutorial and learn how to calculate simple interest!